It’s been a week since the Pats won title No. 6, and the reality is finally starting to settle in that football season is now officially over. We here at The 300s will obviously have you covered on any and all Patriots offseason news. Of course, we’ll also be sure to provide you with plenty of hot takes, bold predictions, and passionate tirades regarding our own feelings about how Bill & Co. should do things as well. But before all that, let’s take one more look at this year’s championship squad, as I grade out each grouping based on their 2018 performance. Today, we’re going to stick to the offensive side of things, with my take on the defensive guys coming later in the week. There’s even some accolades that will be presented at the end, which will give some well-deserved shine (or shame) to a few players who really stood out this year, for better or worse. Giving Tom Brady anything less than an “A” grade is something I never thought would occur in my life, but I must be objective here. By most NFL standards, Brady still had a pretty good season; he finished in the top 10 in terms of both passing yards (4,355) and passing TDs (29). But by “Tom Brady” standards, he was a bit off. Both his TD rate and interception percentage were the worst they’ve been in about five years. And while he did post five 300-plus-yard games, rarely were there times when I felt like Brady was THE reason the Pats were victorious in a particular contest. There were even a few games this year where he was just plain bad (i.e. at Detroit, at Tennessee, at Pittsburgh, and versus Buffalo at home). However, he was still MONEY when it really counted, though, especially at the end of the AFC Championship in Kansas City, and there’s still nobody else I’d rather have leading the way. As we’ve seen throughout much of the NFL in recent years, the Pats use a multi-back system which does not allow for one guy to get all the love; however, what makes the Pats’ system so effective is the fact that each player within it has his own defined role, and each role was executed almost to perfection this season. While he did miss four games due to injury, rookie Sony Michel was vital in helping the team finish fifth in the league in terms of total rushing yards on the year. He hit the 100-yard mark six times in the regular season and finished just 69 yards short of breaking the 1,000-yard threshold (and again, he did so even while missing almost a quarter of the season). He also threw in two more 100-yard games in the postseason and finished with 12 TDs overall, six of which were in the postseason. Perhaps even more impressive is that he was able to do so even though the defense knew exactly what was coming, as Michel carried the ball on almost 70 percent of the offensive snaps he played. Some of that has to do with exceptional play by the O-line (more on that in a minute), but the kid also got it done when called upon this year. 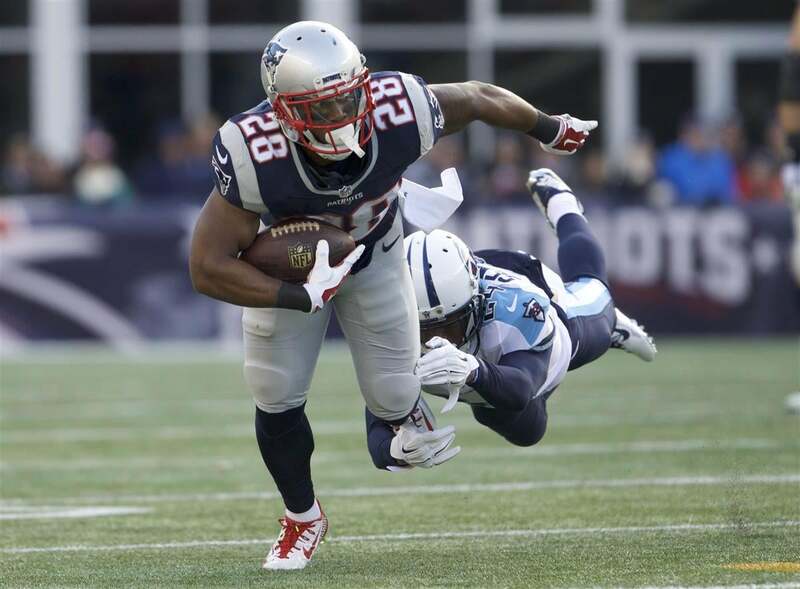 James White finished with 425 yards on the ground (on just 94 attempts) and finished with five rushing scores. But, as everyone knows, his value lies in the passing game, where he led the team in targets (123), receptions (87), and receiving TDs (7). He and Julian Edelman kept the passing game alive, even at its very lowest points this year. He was pretty invisible in the Super Bowl, but he was a huge chain-mover against both the Chargers and Chiefs in the team’s other two postseason games. He was the definition of “Mr. Reliable” this year. White really did so much for the team’s offense this year. Rex Burkhead could barely stay on the field this season, and besides a solid playoff run, he was pretty lackluster otherwise. Even when he played, he averaged just 3.3 yards a carry on 57 totes. Still, Michel and White were one helluva 1-2 punch this season. To be entirely honest, Julian Edelman is the only reason why this grouping gets anything even close to an average grade, as it has been a very trying year for the team’s pass-catchers. While Edelman has been exactly as good as he was before the injury/suspension, those first four games without him this season were pretty rough. Gronk has also been a major disappointment this season. Though he came alive during the two most important games of the year in the AFC Championship and Super Bowl, he averaged three catches and 50.5 yards in the 14 other games he played. He also only hauled in thee touchdowns. Those are some pitifully low numbers when comparing them to the rest of his career. While his blocking was still on point, basically serving as an extension of the offensive line at times this season, he was almost invisible in the passing game for much of the year. At least the big fella still laid the smackdown on opposing defenders whenever called upon to do so. Then there was the whole Josh Gordon saga. (Gordon and his 18 yards per catch would have provided a nice little bump to the grade if, ya know, he was still here and all.) But besides that, all the team had was Chris Hogan, Phillip Dorsett, and Cordarrelle Patterson – and, truthfully, Patterson was actually used as a gadget running back much more so than a receiver as the year wore on. As I said above, Edelman, White, and a solid ground game were the reasons why the Pats were able to move the chains so well this year; it was certainly not due to a prolific passing attack. 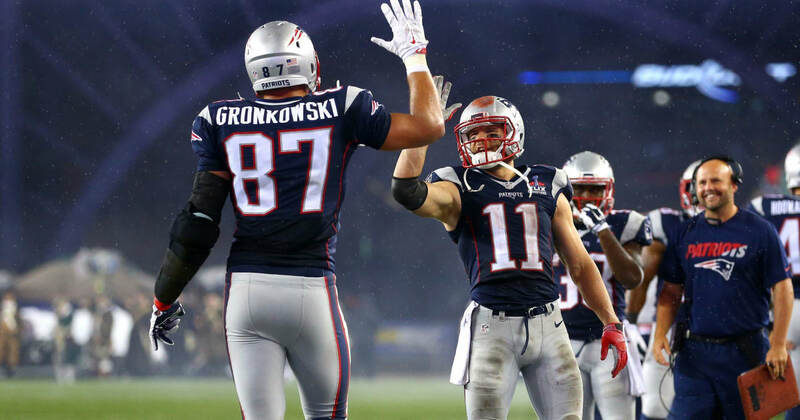 In fact, Edelman and White alone accounted for 43 percent of the team’s total receptions on the year. The timing-based, short-passing scheme continues to defy logic and still somehow baffles NFL defenses, but the Pats still need to add some playmakers on offense, especially as Brady gets older. This should be the first area they focus on doing so. So I might have been a bit too aggressive with all the pluses there, but the offensive line was truly exceptional this year. (And if you followed The 300s at all this year, you shouldn’t be surprised.) Not only did they allow Brady to be sacked just once in three postseason games, but they also allowed the third-lowest pressure rate overall this season. In total, he was sacked 22 times in the regular season. More important, though, is the fact that the line barely even allowed people to get in his face, which is extremely vital to both the success of the team’s timing-based offensive scheme and, more importantly, the health of its 41-year-old quarterback. And, as mentioned above, they also led the way for the league’s fifth-ranked rushing offense. Rather, it was arguably the single best line in the league this season, ranking third in Adjusted Line Yards, first in Adjusted Sack Rate and third in pressure rate. All for the ridiculously low cost of just $14,539,489 against the cap. By way of comparison, consider the Chargers, who took on a cap hit of $14,968,750 this year for just left tackle Russell Okung, who gave up more sacks during the Chargers’ divisional round loss to the Patriots (one) than the Patriots have all postseason. The main group of guys – left tackle Trent Brown, left guard Joe Thuney, center David Andrews, right guard Shaq Mason, and right tackle Marcus Cannon – also started together 94 percent of the time in 2018, showing incredible toughness and durability. The O-line was absolutely dominant this season, in every sense of the word – and that still might not be giving them enough credit. (Offensive MVP): The Offensive Line – I’m usually averse to giving individual awards to an entire group of players, but it’d actually be more of a travesty if I didn’t this year. Sure, you could argue that White or Edelman would be worthy candidates as well, but much of their success derives directly from the play of the big boys up front. The O-line was the team’s keystone this year, plain and simple. (Biggest Surprise): James Develin – I gotta give some love to “Jimmy Neck Roll.” The 30-year-old fullback has long been an unsung hero in the Pats offense, paving the way for the team’s rushing attack and serving as an extra piece to protect Brady in the backfield. But this year he was called upon to be much more, setting career highs in carries (6), receptions (12), and TDs (4). Considering he averaged just five total touches per year in his previous five seasons with just one career score, Devs stepped up big for this team in 2018. (Biggest Disappointment): Chris Hogan – A lot of people might want to give this one to Gronk, but at least Gronk provided something of substance to the team’s offense even when he wasn’t catching the ball. For a guy who was expected to be the team’s leading man during Edelman’s suspension, Hogan hauled in just eight catches on 15 targets in those first four games; he then went on to compile a measly 27 catches over the next 12 games he played. He wasn’t completely useless, and he did average over 15 yards a catch. Perhaps he is simply nothing more than a No. 3 option with some deep-threat ability, which still has a lot of value in today’s NFL. However, that is all he’ll ever be, and nothing more. Be sure to check back in later in the week for the rest of the grades, when we focus on the defense and special teams guys! This entry was posted in NFL, Patriots and tagged Gronk, Gronkowski, James White, Julian Edelman, New England Patriots, Patriots, Patriots 2018 Season, Patriots Grades, Patriots Report Cards, Patriots Season Recap, Patriots Super Bowl, Pats, Rob Gronkowski, Sony Michel, Super Bowl LIII, Tom Brady. Bookmark the permalink.